Ryan Gosling stars in "First Man." Just like its subject, First Man is at its best when it's flying. The latest from ambitious director Damien Chazelle, First Man uses the particulars of Neil Armstrong's emotionally stunted life as a framework to tell the story of the great space race of the 1960s. Chazelle has concentrated before on artists willing to sacrifice all for their craft (Guy and Madeline on a Park Bench, Whiplash and the Oscar darling La La Land), and here he's centering a film on a similarly excessively focused man and his ability to accomplish great things while doing irreparable harm to his personal relationships. But it's not in that thorny emotional landscape, material that may not be that familiar, that First Man soars. Instead, the film works best in putting its own spin on well-worn territory — space exploration, specifically the era previously chronicled in The Right Stuff and Hidden Figures, then extrapolated upon in countless sci-fi films. 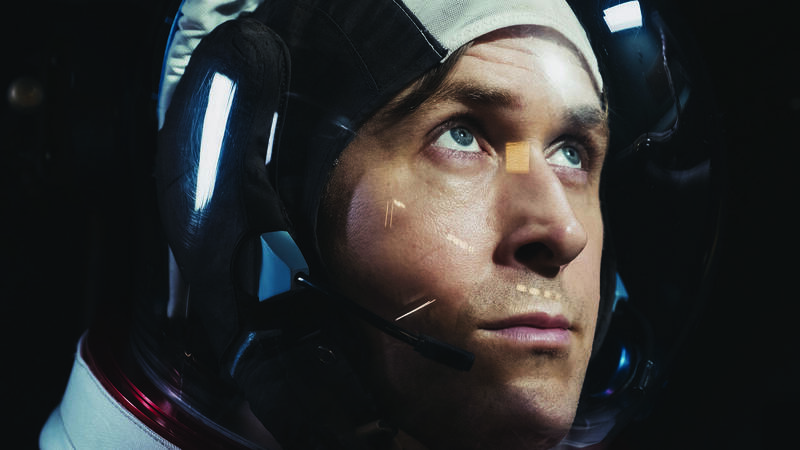 Chazelle and collaborators Linus Sandgren (cinematographer) and Tom Cross (editor) do an astounding job of putting us right inside the rockets with Armstrong (Ryan Gosling, underplaying considerably but still magnetic) and his fellow astronauts. Over and over in my notes on the film, I used words like "harrowing" and "claustrophobic." If ever a film so clearly showed just exactly what kind of tin cans these men were shooting off into space, it's First Man. Right from the start, we see Armstrong piloting an X-15 above the Earth, then bouncing off the atmosphere and coming dangerously close to being lost in space. We're witnessing not only how unfathomably dangerous this calling is for Armstrong and his compatriots, but also how particularly suited Armstrong is for the job. Though clearly shaken, he calmly assesses the problem and comes up with a brilliant solution. He does the same again, years later, when Armstrong is piloting the Gemini 8 in its mission to dock with an unmanned ship. It goes well, until it suddenly, disastrously goes all wrong, but Armstrong quickly scratches out some calculations and saves the day. It's that kind of technical know-how and acumen that he attempts to bring to what Chazelle posits is his life's defining tragedy: The death of his 2-year-old daughter Karen to a brain tumor. Armstrong keeps his emotions private, even from wife Janet (Claire Foy), but he takes copious notes and performs extensive research, though it's all for naught. Later, his colleagues barely know Karen existed, though Gosling — while still keeping his Armstrong remarkably penned up — does show just how much the loss affected the man. But how do you dramatize an inner life when Armstrong held his at such a remove that he practically didn't have one? That's a conundrum Chazelle and screenwriter Josh Singer (Spotlight, The Post) don't exactly resolve. That's not for lack of trying by Gosling and Foy, the latter of whom gives a simply remarkable performance in a traditionally thankless role. As a result, the viewer may be impatient to return to space, just as Armstrong is. And who can blame them? What Chazelle accomplishes in the spaceflight scenes and, even more so, after the Eagle has landed on the surface of the moon is quite astonishing — particularly that lunar sequence, when everything goes absolutely silent for a moment, all the better to let the enormity of the accomplishment sink in. The moon landing happened four years before I was born — before my parents even met, actually — so it has always just been a matter of accepted fact to me. Of course, I knew how dangerous space exploration is — the explosions of both the Challenger and the Columbia are both searing moments in my memory. But First Man is an excellent reminder of how virtually impossible Armstrong's (and the others') achievement truly was.